This is your license to Geocache! Made of solid metal and plated in 24k gold, the Geocaching License is the size of a credit card and will fit easily in your wallet or pocketbook. This is your license to Geocache! 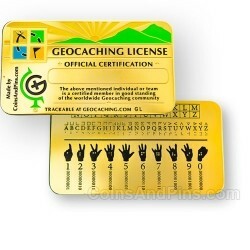 Made of solid metal and plated in 24k gold, the Geocaching License is the size of a credit card and will fit easily in your wallet or pocketbook. We can also custom engrave your name. It is very durable and will not bend under normal pressure. - Familiar to every geocacher is the ROT13 substitution cipher located on the very top. - Down from that is another widely used cipher known as the pigpen cipher. This may also be called the Tic-tac-toe or masonic cipher. - Next, you are given some codes for numerals. 0-9 in sign language, Braille and binary code. 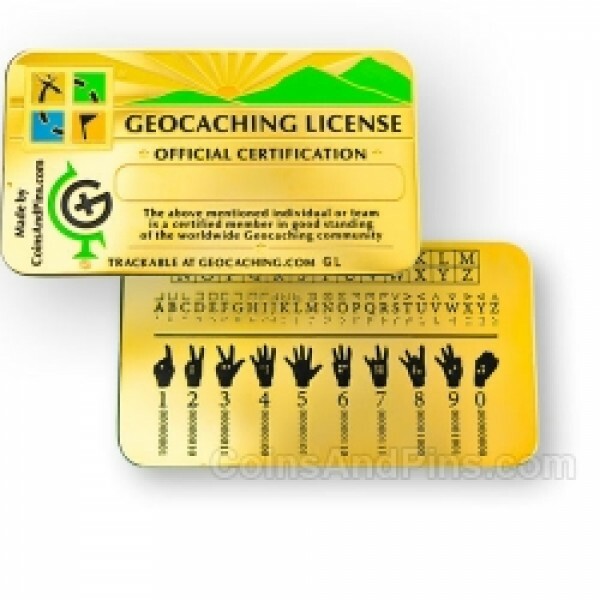 Your Geocaching License is not only your official certification of caching, but a tool to help you blaze through Mystery caches without the internet!